Ships live lives not much differently than those who who build them. As the 'SS Malolo' rolled off her slipway in 1927, she was already Matson Navigation Company's "Pride of the Pacific". She will soon lead a growing family of passenger ship's: Matson's new fleet of White Ships. For branding purposes, the SS Malolo's stunning umber hull was painted pure white in 1931 in order for her to match the appearance of her sister ships, the Lurline, the Monterey, and the Mariposa. 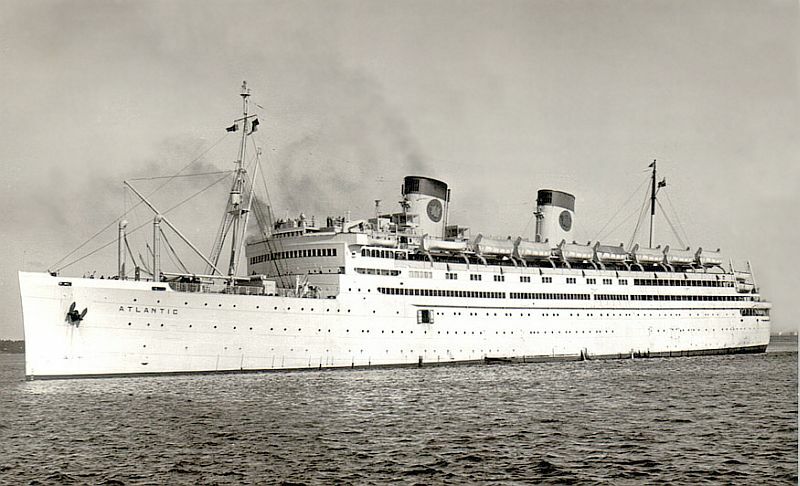 In 1937, the Malolo was rechristened the SS Matsonia in honor of the company's founder, William Matson. During WWII, Matson's entire fleet of passenger and cargo ships were requisitioned for the war effort, and the 'Matsonia' was no exception. Here she is, now re-painted in wartime grey and moored off Fort Mason in San Francisco. Note the newly constructed Coit Tower on the hillside to the right. Altogether, the 'Matsonia' undertook thirty-three separate trans-Pacific voyages during the war, steaming 328,301 miles while transporting 163,732 passengers on behalf of the war effort. With the war over, the SS Matsonia underwent some restoration work to restore her use for civilian purposes. Once again, the 'Matsonia' began her focus on serving the needs of Matson's passengers until April 1948, at which time she is sold to the Home Line. She is once again renamed, this time being rechristened as the "SS Atlantic"
On December 23, 1954 the "SS Atlantic" was transferred to the recently formed National Hellenic American Line, a subsidiary of Home Lines. It is at this time she is renamed "Vasilissa Friederiki", being Greek for "Queen Frederica". In November 1965 she was sold to Dimitri Chandris Piraeus or Chandris Lines, but was registered for Themistocles Nav, S.A. The Queen Frederica would now feature the much loved traditional Chandris blue and black topped funnel with a large white "X" - being Greek for Chi, an abbreviation for the word "Christ". Here she is as the "RHMS Queen Frederica"
Courtesy of Jim Shaw "RHMS Queen Frederica"
She was chartered by Blue Seas Cruises who operated her for another popular series of Mediterranean cruises out of Palma de Mallorca during the warmer months, from April through November 1973. However, with the conclusion of this charter she was again laid up at Piraeus as now there was little to no work available for this once great old liner. She remained there until 1977. Finally, fifty years after being delivered to Matson Line, the superb SS Malolo (aka SS Matsonia, SS Atlantic and RHMS Queen Frederica), was sold to Greek breakers in July 1977, and because she had been shut down some years earlier and classified as a “dead ship” she had to be towed to the Eleusis breaker yards. During the breaking up process in February 1978, while her interiors were being demolished... a spark from a workers torch started a fire at which time she was totally gutted by fire. All work was halted. Three years later, her ravaged hull could still be seen among the other rusting hulks awaiting their fate at the breakers yard.